I have been writing. Writing, writing, writing. Book 2, Book 2, Book 2. And sometimes talking about Book 2 to my husband, who patiently listens and even throws in his two cents occasionally as I try to work out my novel's issues out loud with him. And writing some more. And dreaming about Book 2. And listening to music that particularly inspires me for Book 2. And researching stuff I need to know about for Book 2, the rodeo, for instance. And talking into my voice recorder, which mostly happens while I am driving, the recorder swinging from my rearview mirror while I dictate dialogue and plot points and genius ideas, all for Book 2. In other words, I haven't been doing much but writing these days. But yesterday I made an exception, because the Smart Chicks were here. This is a group of YA authors who are touring all over the country this month, a fun and rowdy and talented group of women who all have amazing books. 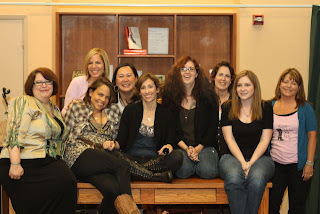 Last year, when I was writing Unearthly, I read all the YA books I could get my hands on, for research, I told everybody. But really it was because I loved reading them! 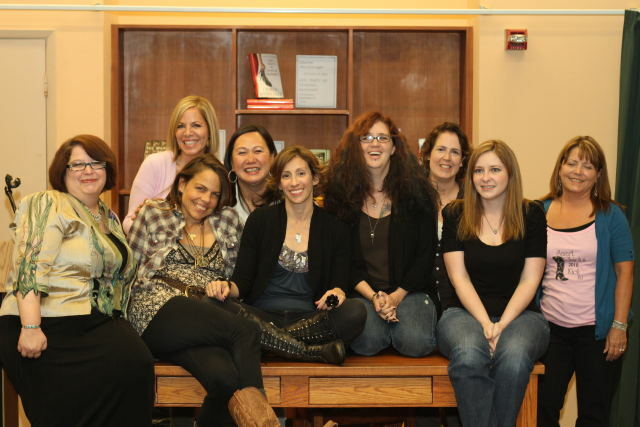 And so many of those books were written by these women. I am a total fangrrl, is what I'm saying. So I packed myself up and made the one-hour trek in LA rush hour traffic to Pasadena to see them. Geek to the core, I arrived an hour early, went straight up to the info desk to grab my signing ticket (at these things, the lines to have the authors sign their books is so long they give you a number, so they can call you inside the bookstore in groups) and spent the next 15 minutes agonizing over which books I wanted to buy to have signed. Up until this moment I had thought the Kindle was the best invention ever. Now, because I read almost everything on Kindle, I had nothing for the authors to sign. There were just so many books, and so little money! I settled on a few books, then headed outside to this nice little area where the Smart Chicks would be presenting. I found myself a good seat. I met all the women sitting around me. Seriously, one of the girls sitting right next to me brought more than 30 books from home to be signed. 30, people. Seriously. I was worried for her back, lugging that bag around. I was worried for the authors' cramped fingers. A couple of my Pepperdine students showed up, so we chatted about the difference between literary readings and YA signings. Here's the difference in a nutshell: screaming. Especially when the Smart Chicks started handing out ARCs of their latest books. Screaming, jumping, wild cheering. That and I've never heard fans of Ron Hansen or Annie Proulx play MarryShagCliff, where the fans name the character from the author's book whom they would like to marry, the one they'd like to um, kiss, and the one they would throw off a cliff. The writers seemed be having loads of fun. I've been to some literary readings where the writers looked like they'd rather be getting their teeth pulled, so I found all the fun and games refreshing. And the fans. . .wow. Did I mention the screaming? My students, of course, were far too cool and sophisticated to get so excited as the wild-eyed, book-laden YA fans, but my student Lauren proved to be pretty adept at snagging stuff out of the air when the authors started throwing book-related knick knacks and gifts out to the crowd. My other student in attendance, Zach, was simply trying to maintain his testosterone level in this large crowd of mostly women. Oh, what students will do for extra credit. . . I, for one, was encouraged by the enthusiasm of the fans. Some of these people could be my fans someday soon. And that was indescribably cool to think about. And humbling, in a way. I was so excited to meet Katie that I hugged her.﻿ She was nice enough to not get too freaked out. We had some time to talk as we waited for our numbers to be called, and it was so great, just shooting the breeze about our current deadlines and our experiences in publishing and our writing lives. I would have driven the hour just to meet her. I'm sure I sounded starved for companionship, but really, that's what I am. I need the companionship of other writers, YA writers especially! That's been largely missing from my life since I moved to California, and it's something I yearn for (here's the part where my husband says, "what I am, chopped liver?" and I say "no, dear, but you're my husband, you don't count" and he looks all offended). I need me some writing peeps! Finally my number was called and I got to go inside and up the stairs, where the Smart Chicks were sitting at long tables signing copies of their books. First I got to meet Mary Pearson, who wrote one of my favorite books this year, The Adoration of Jenna Fox. I own this book on Kindle but bought a hard copy, I liked it that much. In fact, I remember turning to my husband after I finished reading it and saying, "Well, I wish I had written that." Very cool book. I was completely tongue-tied when I got to Melissa Marr. I managed to get out that I had bought a book for her to sign for my old friend and college roommate, Amy, who adores Melissa Marr. A-dores. And she said thank you and then said something nice that I didn't catch because I was so star struck, and I totally forgot that I had my camera. Now kicking myself that I didn't get a picture with Melissa Marr. I did get pictures with some of the other authors, but most of them didn't really turn out because, in order to get a picture, the author had to lean forward and I had to lean way back over the table, which is not the best angle for me. Everyone was sooooo nice. 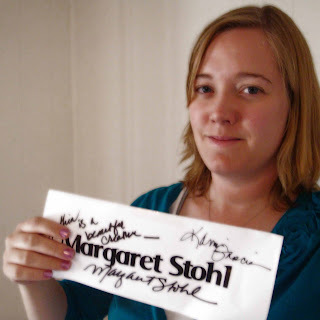 Margaret Stohl even pulled off her own name card and signed it for me when I told her how much I loved Beautiful Creatures, but alas, it was on my Kindle! After the signings I went back downstairs and found Katie again, who was still outside waiting. It was a long line, did I mention? She mentioned a group of YA writers in the LA area called the LA YAs. Woohoo, writing peeps! Then, after a little more talk with her﻿, I went home. Through traffic (although not so bad now, as it was close to 8pm), in the dark. I didn't mind at all. It was great to meet you, too! And such a fun event. I work in a bookstore and was lucky enough to get an advance copy of your book, and I just started (and finished) it yesterday. It took a few chapters for me to really get into it, but once I did I was completely hooked right through to the end. This series is going to be huge, and I'm already looking forward to the second and third books. Congratulations on such a fantastic debut! I just wanted to say that I read a galley of Unearthly and I'm about to put in a review on NetGalley (will also post it on my blog after it's accepted). I have to say that I wasn't too keen on the idea to read an angel book, because they're not my favourite in the paranormal genre, but I absolutely LOVED this book. You've so changed my mind about the angel thing, although I doubt I'll find another as fabulous as this one. I can't wait for the next book. There is going to be a next book, isn't there?